Check out the latest Kira Kira Crate Spoilers on My Subscription Addiction! Kira Kira Crate September 2018 Spoiler #2 + Coupon! Kira Kira Crate September 2018 Spoiler #1 + Coupon! Kira Kira Crate August 2018 Spoiler #2 + Coupon! Kira Kira Crate August 2018 Spoiler #1 + Coupon! 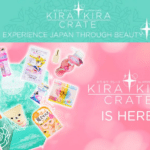 Kira Kira Crate August 2018 Theme Spoiler + Coupon! Kira Kira Crate July 2018 Spoiler #3 + Coupon! Kira Kira Crate July 2018 Spoiler #2 + Coupon! Kira Kira Crate July 2018 Spoiler #1 + Coupon! Kira Kira Crate June 2018 Spoiler #3 + Coupon!